You know already: No Winter Holidays without a trip to New York City, magical as it can be! Bogdan and I love this time of the year very much so we couldn't miss it. A first post is this one with the outfit that I wore on that day! Brown - mustard - teal with a side of red boldness! Predictable right? Stay tuned for the next post where you can see the wonderful Holidays Spirit in NY through my lenses! Have a joyful weekend everyone! FANTASTIC color combo!! I love your pants with those boots. This is an amazing look! I am literally addicted to your blog and here’s another simple but PERFECT outfit! Love the mix of colours with the bold pop of red. I am always looking for new colour combinations as I have a blazer in this curry colour. Love the style of your coat and it looks fabulous with brown and curry. Your little brooch is so cute! stunning coat <3 you look great! love the coat and color combo…gorgeous! You are such a master of color. Blue and animal print are a combo that I love. I love the depth the brown gloves add to the look and the red is a nice touch. In fact, it really makes the bag stand out.You fave me a great idea on how to infuse red into this palette, which I probably would not have considered without your inspiration. I have a scarf just like the one you are wearing and I love it! Great outfit. I love the long leather gloves!!! Super cute the way you mix colors!!! Come visit my blog. New post today! Great Look!!! 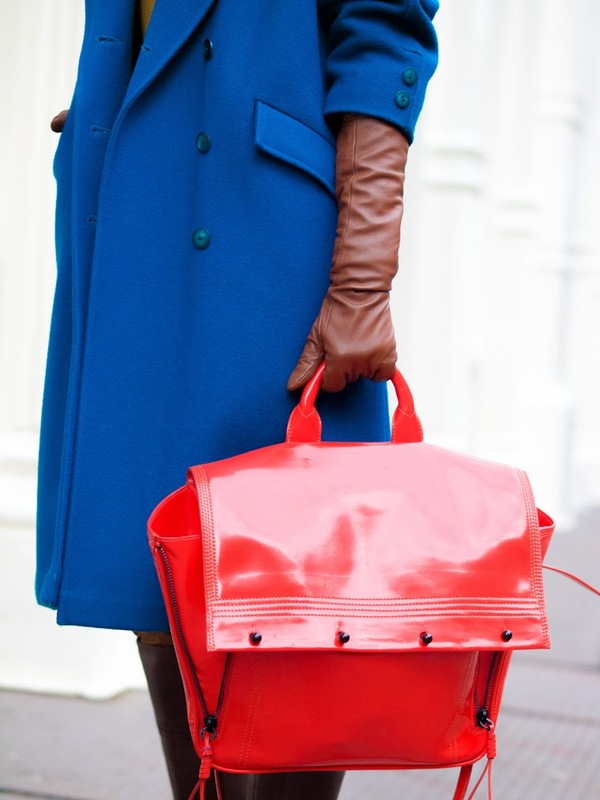 Love the bag and coat!! Like how you skillfully, beautifully and stylishly combines bright colors! I love your coat and gloves!! You look fabulous!! Lovely combination! This may be my favorite look! Love it!